This boxed starter kit contains all the equipment you will need to make a 30 bottle batch of quality wine. It comes with sterilizer, and a secondary fermenter which is essential for winemaking. It has higher quality fermentaters that other kits, and a telescopic de-luxe model syphon containing a tube clip for controlling the flow of wine at bottling time; this is the only syphon that is compatible with the new Mark 4 beer and wine filter. This syphon also comes with a transparent tube attachment that allows you to get the syphon going without contaminating your wine. 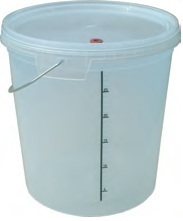 - 100g VWP cleaner sterilizer. Does not come with a wine ingredients kit, so you will have to buy one separately; for beginners, we would suggest starting with a Cantina wine kit as they are very easy to make, great value for money, and are ready to drink in just 5 days! We have found the Cantina Pinot Grigio very good, remarkable for a wine thats ready to drink in 5 days, and costing about a Euro per bottle to make!